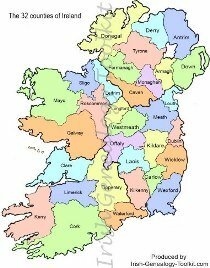 Below are brief details of the counties in Ireland that begin with the letters T to W: from Tipperary to Wicklow. In Irish, the county is called Tiobraid Arainn, meaning the Well of Ara. It is in Munster province and, for administrative purposes is split into North and South Ridings. This is because it is the largest of the counties in Ireland's interior. It is also famous for having the highest count of cattle. With 624,388 beasts (2006), it has four times more cattle than people - the highest ratio of any of the counties in Ireland. Its principal towns are Carrick on Suir, Clonmel (the county town), Cahir and Tipperary itself. The latter is an important and traditional dairy farming town. 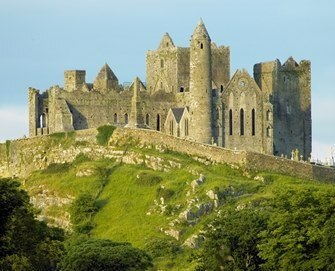 Also within this county is the Rock of Cashel, said to have been created by the Devil. According to 1890 records, the most common surnames associated with County Tipperary include Ryan, Maher, O'Brien, Kennedy, Dwyer, Hogan, Hayes, Gleeson, McGrath, Walsh, Kelly and Lonergan. Tipperary was one of the first counties in Ireland to be surveyed for Griffith's Valuation, in 1850-51. In Irish, the county is called Tír Eoghain, meaning the Territory of Eoghan. It has the lowest population of the Ulster province counties within Northern Ireland (UK) and is primarily a farming region. It is known as O'Neill County in referrence to the medieval family who once controlled the area. 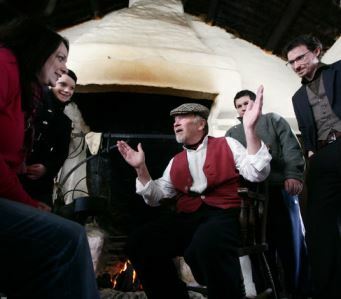 Storytelling at the Ulster American Heritage Park in Omagh, County Tyrone. Tyrone has fabulous hill and forest scenery and is home to the Ulster American Folk Park which celebrates the strong links between Ulster and North America. Its county capital is Omagh, but Strabane and Cookstown are also communities of significant size. 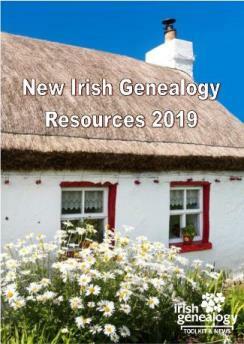 According to 1890 records, the most common surnames associated with County Tyrone include Quinn, Mullan, Kelly, Donnelly, Gallagher, McKenna, Campbell and Hughes. Griffith's Valuation was carried out in 1851. In Irish, the county is called Port Lairge, from the Viking name Vadrefiord. It is in Munster province and is one of the sunny coastal counties in Ireland's south. As such, it is a popular destination for holidays in Ireland. It's a prosperous place with wonderfully varied scenery and its name is famously linked with the crystal glass made in the county town. It is even referred to as the Crystal County. An alternative moniker is the Decies County due to its historical links with the Celt tribe of that name. In 1831, County Waterford had a population of 176,898 (87 people per km2) and that density was repeated in 2002. According to 1890 records, the most common surnames associated with County Waterford include Power, Walsh, O'Brien, Murphy, Ryan, McGrath, Foley, Flynn, Morrissey and Kelly. 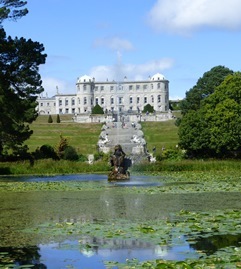 Waterford was surveyed by Richard Griffith for his Valuation in 1848-51, making it the second county to be valued after Dublin. 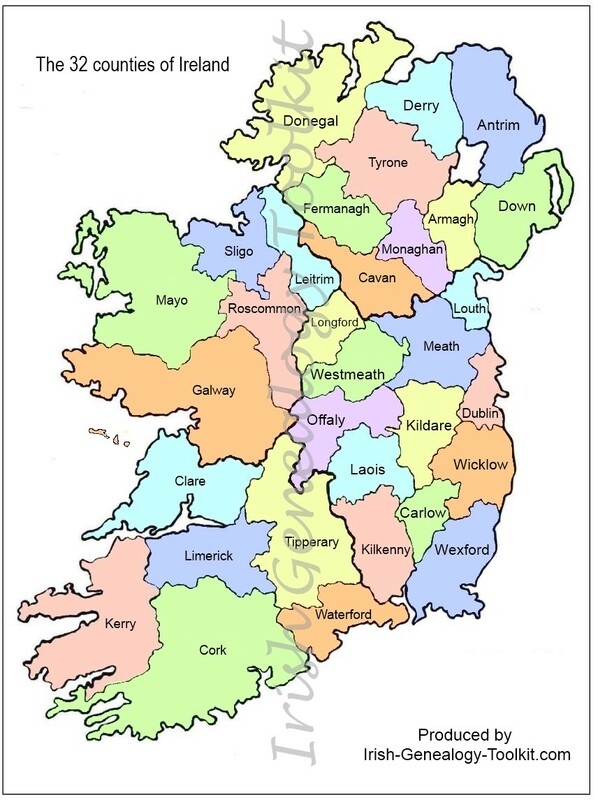 In Irish, the county is called Iarmhí, meaning Western middle province. At its heart is the Hill of Uisneach, which was believed to mark the spot where the ancient Irish provinces converged. Westmeath is now in Leinster province. Its main settlements are the former garrison town of Mullingar and the strategically important Athlone which straddles the River Shannon just before it flows into Lough Ree. An uninhabited island in the Lough is said to be the geographical centre of Ireland. According to 1890 records, the most common surnames associated with County Westmeath include Lynch, Farrell, Reilly, Daly, Murray and Duffy. Griffith's Valuation was carried out in 1854. In Irish, the county is called Loch Garman, but the Viking name of the district was Weis fiord, meaning harbour of the mudflats. That may not sound too inviting, but Wexford is the island's most south-easterly county and it has some gloriously sandy beaches. This makes it a popular destination for an Irish holiday, especially for families with young children. In land area, it is the largest of the counties in Ireland's Leinster province but it is not densely populated. In 2002, population density was 50 persons per square kilometre. Some 160 years earlier, in 1831, that figure was 86 persons/km2. Because it is sunnier and drier than all other counties in Ireland, its inhabitants are nicknamed the Strawberry Pickers. An alternative, and possibly more common, nickname is Yellowbellies. The county is also known as the Model County due to its progressive farming methods and model farms. Enniscorthy, New Ross and Wexford are its main centres. According to 1890 records, the most common surnames associated with County Wexford include Murphy, Doyle, Walsh, Bryne, Cullen, Kavanagh, Brien, Roche, Kelly, Nolan, Redmond and Connor. The county was surveyed for Griffith's Valuation in 1853. In Irish, the county is called Cill Mhantáin, from the Viking name Viking Gelo. It is in Leinster province and is famous for the Wicklow Mountains and the hauntingly beautiful Glendalough. Because goats roam the mountain areas, people from Wicklow are known as Goat Suckers. Rather more pleasantly, the county itself is referred to as the Garden of Ireland. It was the last of the counties in Ireland to be 'shired', in 1606. Its main towns are Wicklow, Arklow and Bray. According to 1890 records, the most common surnames associated with County Wicklow include Byrne, Doyle, Murphy, Kelly, Kavanagh, Nolan, Brien, Kehoe, Lawlor, Toole and Dunne. Griffith's Valuation was carried out in 1852-3.